Located at the southeast corner of Main Street and Rupert Avenue in Winnipeg, the Strathcona Hotel was commissioned by Joseph “Jacob” Rosenthal (1866-1935) and built in 1905. The six-storey building was based on designs of Henry S. Griffith and constructed for around $75,000. Its frontage was 48 feet along Main and 120 feet along Rupert, with an exterior of imported brick trimmed with Tyndall stone. The main floor featured maple and mahogany woodwork, and contained a rotunda, offices, vaults, cloakroom, dining room (70 feet by 24 feet), bar (20 feet by 44 feet), billiard room (20 feet by 24 feet), and kitchen. On the second through sixth floors, over 80 rooms were available for occupancy, all finished in British Columbia fir. On 1 April 1907, ownership passed from Rosenthal to brothers Archibald McLaren and Alexander S. McLaren. It was purchased in 1911 by brothers John Edward Fitch (1871-1945) and James Albert Fitch (1880-1938) before being reacquired by Rosenthal in 1915. In July 1928, the property was put up for mortgage sale and acquired by realtor William J. Christie. By 1932, it had re-opened as the Cornwall Hotel and was being managed by Charles W. Edie. In January 1967, the building was salvaged then fully demolished to make way for the Manitoba Museum. Source: Winnipeg Tribune, 16 December 1905, page 17. “Sidewalk cleared,” Winnipeg Tribune, 26 August 1905, page 15. “Strathcona Hotel,” Winnipeg Tribune, 16 December 1905, page 22. 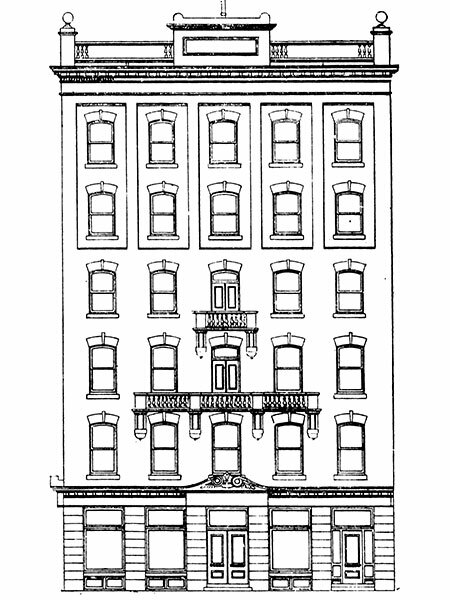 “A million dollars in new hotel buildings [The Strathcona Hotel],” Manitoba Free Press, 30 December 1905, page 44. “Pressure is very feeble,” Winnipeg Tribune, 28 February 1906, page 1. “Strathcona changes hands,” Winnipeg Tribune, 25 March 1907, page 1. “Local news paragraphs [Take over Hotel],” Winnipeg Tribune, 30 March 1907, page 16. “Strathcona Hotel,” Manitoba Free Press, 11 February 1913, page 17. “Big reduction in bartenders,” Manitoba Free Press, 4 June 1915, page 5. “City and General [Strathcona Hotel dry],” Manitoba Free Press, 4 June 1915, page 5. “Do want any aid from lawyers,” Manitoba Free Press, 5 June 1915, page 5. “Notice - The Liquor Control Act,” Manitoba Free Press, 18 June 1915, page 2. “New Strathcona Hotel,” Winnipeg Tribune, 26 April 1919, page 5. “First violation of new act,” Manitoba Free Press, 8 February 1924, page 6. “Empire Hotel changes hands for $275,000,” Winnipeg Tribune, 5 November 1927, page 6. “Mortgage sale of valuable city property,” Winnipeg Tribune, 28 July 1928, page 6. “For sale - Strathcona Hotel,” Manitoba Free Press, 21 August 1928, page 22. Mount Carmel Cemetery, Queens County - New York, [Rachel Rosenthal & Jacob Rosenthal], FindAGrave. Death notice [James Albert Fitch], Winnipeg Tribune, 9 July 1938, page 24. “John E. Fitch dies in B.C.” Winnipeg Tribune, 6 June 1945, page 10. Obituary [Mrs. Rachel Rosenthal], Winnipeg Free Press, 25 October 1955, page 19. [Photo caption; Wrecker’s rates], Winnipeg Free Press, 28 January 1967, page 42. [Personal belongings, demolition notice], Winnipeg Free Press, 9 December 1966, page 32. “Demolition materials for sale,” Winnipeg Free Press, 21 January 1967, page 4.